Electron micrograph of Streptosporangium roseum, copyright Manfred Rohde. Scale bar = 5 µm. 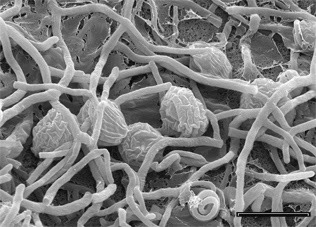 The Streptosporangiaceae are a group of chemoorganotrophic actinomycetes that form a branched, non-fragmenting substrate mycelium. [IJSEM04] IJSEM. 2004. Validation list no. 95: Validation of publication of new names and new combinations previously effectively published outside the IJSEM. International Journal of Systematic and Evolutionary Microbiology 54: 1–2. [ZWR98] Zhang, Z., Y. Wang & J. Ruan. 1998. Reclassification of Thermomonospora and Microtetraspora. International Journal of Systematic Bacteriology 48: 411–422.